Horror movies are not for everyone. The storyline, the jump scares, those moments of tension that make you cover your eyes with the blanket- usually this kind of films is not your first choice when it comes to watching something on a Friday night. However, this year’s release, A Quiet Place, promises almost 2 hours of genuine thrills and hold-your-breath scenes that are scary in a whole new way. 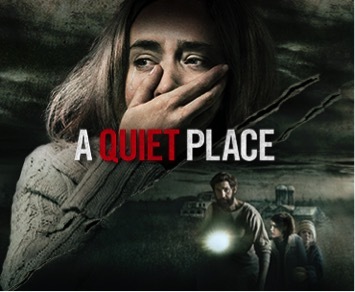 Leave aside all the things you knew about these movies because A Quiet Place is not your usual horror film. The Earth is conquered by a race of blind aliens that have a sharp hearing. These creatures are designed very well, something like the famous Alien, but with some distinct features. They will kill all the people they hear and the only way to be safe is to not make a sound. Co-writer/director John Krasinski plays the father of three children, 2 boys and a deaf girl. His onscreen/offscreen wife Emily Blunt is pregnant with their fourth child. The movie depicts their everyday life, struggling not be heard by those monstrous creatures. They live a simple life at a farm where everything is sound-proofed to help them stay alive. Things like walking, eating, playing, and even giving birth to a child, need to be done very quietly. What makes this movie unique is the fact that it lacks one of the most popular features of a scary movie: the jump scares with loud noises. All the tension is created without any noise and can really make you hold your breath while you are wondering if they are going to make it once again. There are no “blanket on the eyes” moments because you don’t want to miss something important. Moreover, the actors have very few lines. This offers them the chance to “speak” with their eyes, hands, and facial expressions. John Krasinski’s character tries to find a way to destroy these creatures and spends hours in a basement surrounded by newspaper articles and a board filled with failed ideas. Fighting for your life in this movie is like gambling, you’ll never know if the luck is on your side that day. If you are not careful enough, your step can be too loud and they might find out. It’s about discovering and using some skills that were hidden deep inside and are your key to survival. If you follow this link, you might gain some gambling skills, but the ones John Krasinski has in this movie, you’ll have to develop when the evil aliens will roam the Earth. Hopefully, that will not happen anytime soon. A Quiet Place is visual storytelling where the images speak louder than words. You will fall in love with the brave father, the caring mother than doesn’t scare so easily, and the little deaf girl who finds her inner power. This is a nerve-shredding movie about a great emotional adventure.